Introducing the NexStar 6G Series with USB 3.0 and eSATA – a sleek 3.5inch SATA to USB 3.0/eSATA External Hard Drive Enclosure designed to stand tall in performance. It is design to be very fast when linked to your HDD using the USB 3.0 UASP protocol for Windows 8.1/10 or 6Gbps eSATA to shuttle data around in high speed. 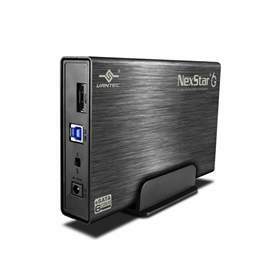 This NexStar follow the tradition of using the latest Aluminum Casing designs to protect the Hard Drive and effectively draws the heat away from the drive keeping your hard drive safe and cool. This NexStar 6G is also designed with smart and green features to extend the life of the drive by spinning down when the system goes to sleep thus saving energy when it is not in use. This NexStar 6G enclosure truly evolves into a newer and better storage enclosure.